The largest living bird on the planet, these giant flightless creatures run at incredible speeds and employ a variety of defensive measures against potential predators. The ostrich is the largest living bird in the world. Ostriches are the largest birds in the world. Found in Southern Africa, they are unique animals known for their lanky walk and awkward demeanor. 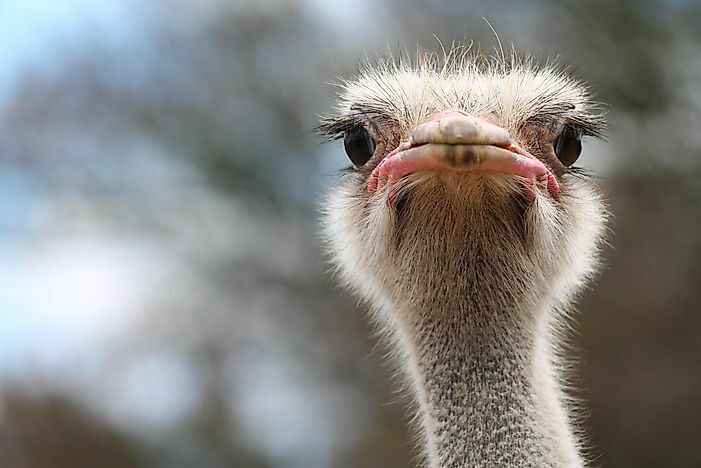 Here are some interesting ostrich facts! 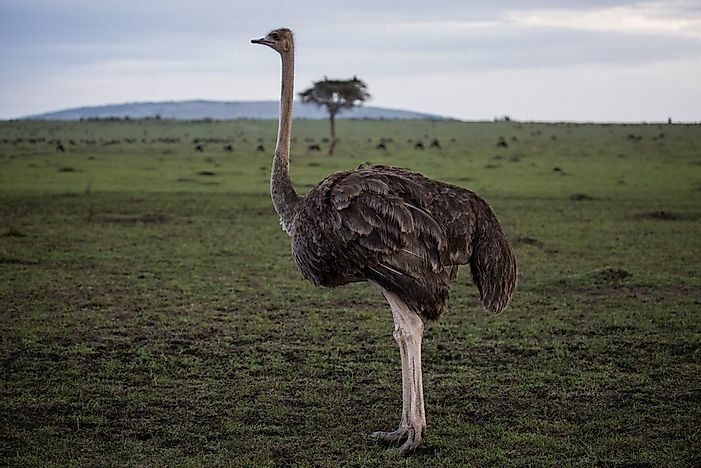 The ostrich is the world's largest extant bird species. It is well-knwon for its long bare neck its slender lower legs, and the muscular thighs that carry its large plumage-covered body. Feathers of a mature male ostrich are black, those of the tail white, and the neck has pinkish or blue color. The female ostrich coloration is characterized by gray–brown feathers. Ostriches' heights spans from 7 feet to 9 feet, and their weights between 250 and 350 pounds. An ostrich eye is two inches across – the largest of any land animal! The ostrich is the only bird with two toes on each foot, which helps it when running. It also uses its longer toe, equipped with a 4-inch-long claw for self-defense. As an omnivore, the ostrich feeds on plants, roots, seeds, flowers, berries, small rodents, leaves, lizards, and invertebrate insects. It mostly feeds by grazing or browsing on trees or shrubs. The ostrich also swallows pebbles which assist in its digestive processes. An ostrich can survive without water for days, as it utilizes moisture in the plants it eats to source the water it needs. Africa’s semi-arid plains, woodlands, savannahs, and grasslands are the habitats wherein the ostrich is to be found. Countries like Kenya, South Africa, Uganda, Ethiopia, Somalia, Zambia, Mali, Chad, Sudan, Mozambique, and Tanzania provide such habitats for them. According to the 2014 International Union for Conservation of Nature (IUCN) Red List, the ostrich is a species of "Least Concern". Nonetheless, their populations are decreasing across much their diaspora. In the long term, what may threaten their existence the most is habitat loss as human settlements and infrastructure construction encroach upon them, as well as their utilization as meat sources. The ostrich is most active early and late in the day. 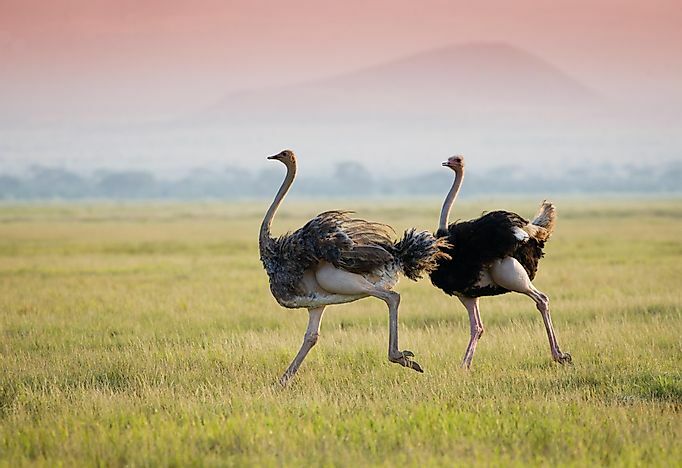 They roam the African savannah in groups ranging from 5 to 50 ostriches. The male is territorial, and will aggressively defend its territory. If threatened, the ostrich either runs or lies low and presses its neck to the ground in order to make itself less visible. This serves as a form of camouflage, as its feathers blend well with the soil colors. This has led to the expression "sticking one's head in the sand" when confronted with adversity and not dealing with it. An ostrich will also fluff its wings and hiss loudly to scare attackers. When attacked, it gives a kick with its strong legs. When predators like lions, leopards, and hyenas approach, the birds can run away at speeds of up to 43 miles per hour. An ostrich uses its wings when running to help it make changes of direction. Ostriches can make a variety of noises, including whistles, booms, and hisses. A female ostrich reaches sexual maturity at between 2 and 4 years of age. Their breeding season is from March through September. To attract a female, the male ostrich performs a mating dance with the wings. The female can lay up to 12 eggs, which are laid in a shallow pit dug by her male mate. Both male and female partners take turns to guard and incubate the eggs for a period of between 35 and 45 days until they hatch. The average lifespan of an ostrich is 30 to 40 years. This page was last updated on July 27, 2017.